A dog training ebook can help you keep a happy puppy! You've picked out your adorable poodle puppy and can't wait to bring him home. Once it's time to introduce him to the family, you're faced with the reality of having to train him and aren't sure how to start or where to begin. 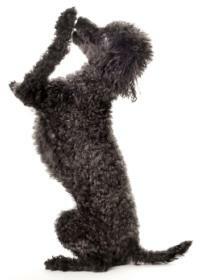 We love our poodles and want to lovingly train them to be the best pets, for them and for us!, that they can be. Sometimes we're not sure how to train her or where to even begin. 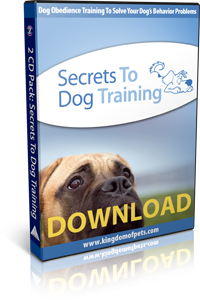 If you're unsure as to how to train your pet and want some tips and advice, I recommend you get Secrets to Dog Training to take the fear out of training. You can get their free ecourse on training which will give you free basic dog training tips and strategies on training your pet. The ecourse is a good precursor to the eBook. Poodles are very smart and constantly learning. We need to teach them good habits, not bad habits. We, as humans, sometimes think our poodles think like us, but they don't! As a result, if we train them wrong, behaviors get worse. Does your pet bite, dig, bark excessively, chew items, jump on furniture or people, use the floor as his bathroom, or suffer from aggression or separation anxiety? If so, you'll want to read this dog training ebook to help you correct and eradicate these behaviors. The book offers instructions for correcting over 25 behavioral issues with pictures and step by step instructions. There's also a video, a member's forum and consultations with dog behavior experts. It's essential for any of us who want to train our poodles with love and compassion. Toy poodles who are spoiled can start to think they are top dog in the house. Behaviors can quickly get out of control with dogs nipping and bossing family members around. They want you to follow their lead. The Alpha Dog lessons in the book will help you eradicate that behavior and let your pet see you are the top dog, not her. Poodle puppies benefit from training as soon as they are brought into your home. This dog training ebook teaches you the techniques for training your dog to sit, heel, come, training your dog to stay, and other basic dog obedience training commands. We have to remember, that poodles, like us, have different personalities. As such, not all dogs respond to training and behavior modification techniques in the same way. This book is an essential guide for learning what works for your poodle. Learn why bad deeds must be caught in the act to be corrected, how to curb your poodle's aggressiveness, dog house training techniques, how to stop your pet from jumping on you, and strategies for peaceful dog and cat cohabitation. You'll learn how to think like your poodle, which makes it easier to understand what she thinks - which makes it easier to understand her behavior. Noone's perfect, not us and certainly not our lovable poodles! We all have annoying behaviors or overdo it sometimes because we just want to have fun. 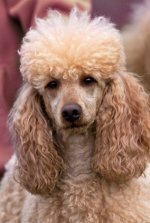 By training our pets with techniques and strategies offered out of love, our poodles will respond happily and change their behaviors for the better.